The image you see is the closest I will ever get to seeing all of my children together. It’s an illusion. Bittersweet is the only word that I can think of that describes it: A representation of the world as it should be, yet a reminder of what I will never have. The feelings that washed over me when my eyes gazed upon this scene were a unique mix of pure joy, wish fulfillment and utter sorrow – all wrapped up into one beautiful moment. How could something elicit such feelings yet be considered a positive thing? It’s simple; it is a microcosm of my life since losing my little boy on October 27th, 2012. Joy and despair coexist in my heart at all times. This picture is my life sketched into one frame that encapsulates everything I feel all the time. Joy and pain standing side by side, holding hands forever. This picture could serve as a constant reminder of what I lost. Somehow I don’t think that was the artist’s intent though. If it were, an empty space would occupy where Rees is standing. Not including Rees in the picture would be a manifestation of every grieving parent’s fear that their child will be forgotten. The parent will never forget, but there is a very real fear that others will. 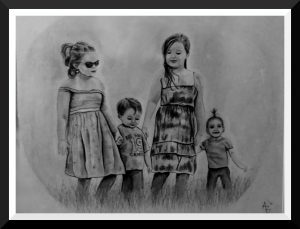 Rees isn’t standing there with his sisters as a reminder of what I lost. He’s standing there as a reminder of what I will always have. No one can take his memory away from me and from others. No amount of time can ever diminish my love for him. This picture is not a reminder of loss – it’s an affirmation of love. The duality of pain and love that coexist in a grieving parent’s soul is something that I thought those who have never lost a child could ever understand. I have struggled to put into words what it feels like. This picture has changed that for me. Everyone who has seen the picture has had the same reaction to it; mixed feelings of overwhelming sadness and pure joy. Hope and despair coexisting at one time. Bittersweet, but beautiful. 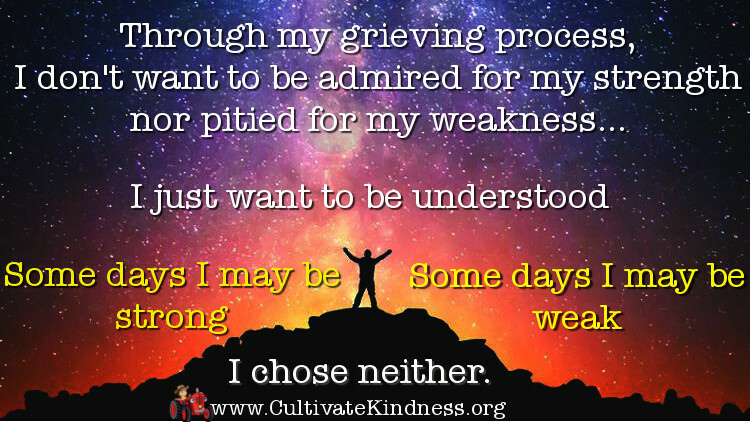 I realized people were experiencing, albeit briefly, how a grieving parent feels perpetually. That bitter-sweetness that never fades, never rests and never, ever goes away. If you know our story you simply cannot look at this picture any other way. That feeling is the feeling a grieving parent faces every waking moment (and even many asleep) of every single day. Losing a child changes the way you see the world in profound ways. It has granted me a perspective that forces me to focus on what I have as opposed to constantly feeding the twin beasts of “what could have been” and “what was”. I have three beautiful daughters who fill my heart with indescribable joy. I have the most amazing companion and soulmate who has remained by my side through the darkest of times. I have a roof over my head. I have my health. I am alive. Life is the greatest gift of all and, ironically, the one that I never really stopped to appreciate all that much until I lost a big part of what I live for. The loss of my little boy forced me to think about life in a new way. Recalling that last embrace of Rees’ lifeless body contrasts an eerie similarity to the first time I held him. A nurse handed him to me, wrapped in a blanket, for me to cradle in my loving arms. Whereas my first embrace filled me with the hopes and dreams of a happy future, the last served as its dark reflection filled with despair, hopelessness and anger. As I held him that last time I kept thinking how he looked like he could just open his eyes at me and smile at any moment. He looked as perfect on the outside in my last embrace as he did 22 months earlier in my first. The only difference was the absence of the spark of life leaving me holding an empty vessel. It made me realize just how tenuous our connection to life really is. As much as I really don’t want to admit it, losing my little boy made me realize just how much his life, and the lives of all of my family and friends mean to me. They say you can’t really appreciate something until it’s gone. It sounds so shallow for me to write that, but it is the truth. It’s not that I didn’t care about life before my son’s death, it’s simply that I never truly appreciated how important each moment is. The death of my son forced a perspective on me that was impossible to shake. Life is a gift and there is no promised future. The present is all we have, and if we want to make our lives count we need to make each of those moments matter as much as possible. It was just this realization that inspired my wife Samantha and I to start our foundation in Rees’ name. We wanted to share our experience with others so that, hopefully, they could get a little bit of this perspective without experiencing the same profound loss. There is a reason why we chose the name “ReesSpecht Life” for the foundation. Respect is treating others the way you wish to be treated and life is that precious gift that we often take for granted. We just want people to take just a few moments to remember why life is important – and why helping to make other’s lives even a little bit better is the ultimate form of respect for it. It’s when we take the time to do the little things that make other’s lives a little better that we start to make a difference in the world.